Our understanding is that the painting will be auctioned with the proceeds going to a charitable cause. Now to the event -- Actually there were three events, or three stages to the event. But we didn't know that until we arrived. We had been told that there would be about 1500 folks at the luncheon. We were not at all sure how or even whether we would actually get to meet the First Lady. But that was okay. We were just happy to be in attendance and to have had the opportunity to make things for her. As instructed, we arrived at the Washington Hilton at 10:30 AM. "We" was Fred; our daughter, Coulter; and myself. Lots of dressed up women, and a few men, were gathering there in the lobby. Some of them wore nametags with names that I recognized -- McGovern, Ryan, Kennedy, Gingrey, Lott, Reid, Pelosi (Mr. Paul, who, I gathered, is a popular and well-liked character). We approached a table to check ourselves in, and that's where we learned that we had tickets to a VIP pre-event reception. Boom, yeah! At about 11:00 the doors to the VIP Reception were opened and we made our way into a room where about a hundred people gathered. Word was that Mrs. Obama would likely arrive shortly. But she didn't. As time for the big event drew near, we were told that the First Lady had been delayed by a security issue, and that she likely would not be present in time for the VIP reception. At the very last few minutes before the big event, though, Event Chair Vivian Creighton Bishop went to the microphone and announced the names of a few people who were to go to a certain door. Our names -- mine and Fred's -- were called! The second group gathered there in the little backstage room was the luncheon planning committee -- a group of about twenty lively and animated women who all seemed to know each other. The third group was us -- the group of eight folks, six from Columbus, Georgia, who had, at the request of the luncheon committee, brought special gifts for the First Lady. The three groups of us were firmly but politely put into position for three group photographs, with a spot for Mrs. Obama in each grouping. For about three minutes we stood there nervously awaiting her arrival. All of a sudden two Secret Service agents entered and stood on either side of the entrance, and then Mrs. Obama herself appeared in the door. She was wearing a bright orange chiffon dress and looked absolutely radiant. She went around the room, one group at a time, shaking hands with and having a few words with each person before she posed for a photo with the group. Our group was last. What struck me most about Mrs. Obama was her warmth and her energy, both of which she exuded in abundance. Though she only had time for a handshake and a few words with each of us, she focused on each person individually as she went down the line. She seemed to relate particularly to the teenage girls, several of whom she hugged, including B.J. Chipman in our group, who had painted a portrait of Malia and Sasha to give to Mrs. Obama. This backstage event lasted only about ten minutes. After all the individual greetings and the three group photos, Mrs. Obama and her entourage left the room, and we rushed to our places in the grand ballroom for the main event -- the luncheon. As far as I was concerned, though, the main event had already occurred. I was deeply moved to have been in the presence of Michelle Obama. Okay -- Now to the luncheon -- About 1500 people were seated at round tables in this giant ballroom with a raised runway down the middle, an entrance area on one end and the head table on the other. Huge tv screens surrounded the room, so that if your sight line wasn't perfect for the head table, you could watch one of the monitors. Before the program started, and at intervals throughout, Fred's painting was featured on the screen -- over and over again, for everybody to see! That was really exciting for us. The whole Georgia delegation, of which we were a part, was seated directly in front of the head table -- down front and center! Representative Sanford Bishop was back-to-back with me, so we chatted and shared excited reactions from time to time. He was recording the whole thing on his iPad, and it was obvious that he was very proud of Vivian and the tremendous job she and her committee had done with the event. I would describe the luncheon itself as a cross between a huge sorority party and a military gala -- as if I've ever attended either -- ha! Vivian Creighton Bishop presided and introduced a whole slew of distinguished guests, many of whom were escorted down the runway by uniformed military personnel. I was hoping that the gifts -- my quilt, B.J. 's portrait, a piece of Alma Thomas ceramic work given by Thomas's great-nephew Charles Lewis -- would be displayed and presented directly to the First Lady. But that was not the case. They were announced, though. And a photo of my quilt was displayed on the tv screens that surrounded the room! There it was! For about five seconds. The other highlight of the luncheon was Mrs. Obama's speech. Within seconds of her assuming the podium she had established rapport with the audience. Her speech was indeed wonderful -- in its content, its delivery ... By this time I was on total sensory overload and can't remember the whole speech, but I do remember that the most significant part of it, to me, was when she pointed out to all those Congressional and other governmental spouses there that "we" -- she included herself -- as spouses, are in positions that allow us, if we will, to temper some of the contentiousness that dwells in politics today. She said it much more eloquently than I just did. At the conclusion of the First Lady's speech, we were treated to performances by three musicians, two of whom, at least, are Grammy Award winners and also Georgians -- Tasha Cobbs (gospel), Monica (pop), and a young man who sang and danced but whose name I did not catch. The printed program indicates that Timbaland performed, but I know what Timbaland looks like, and that was not Timbaland. At any rate, the young man was a fine performer and had us on our feet. All three of the performers were outstanding. Mrs. Obama was up there at the head table rockin' out! The entertainment over and the audience in high gear, Mrs. Bishop again assumed the podium, thanked her committee members, and concluded the ceremony. We were all asked to remain in our seats until Mrs. Obama was escorted from the room, which, of course, we did. Once the ceremony was over and we were able to stand and socialize, it was obvious that we were all absolutely giddy. At least, the Georgia delegation surely was! Mrs. Obama had indeed lit up the room. What had started out as an interesting but little bit confusing "dress up party" had turned into a tremendous celebratory event of which we Georgians can be proud. Oh, I need to say somewhere in here that, unlike most banquets I've ever attended, the food was great! The menu featured Georgia products -- you know -- peaches, pecans, blueberries, Vidalia onions, chicken, sweet potatoes, corn ... Really good, well-prepared food. Okay -- I'll hush and show you a couple of photos. Our official photo has not yet arrived in the mail, and I fear that it may be lost -- but here's one that somebody took as our official photo was being shot. I'm the shortest one in the group, in an aqua blouse. Apologies for that pinched expression on my face. I don't know what was up with that. And my hair -- well, I don't know what happened with that, either. 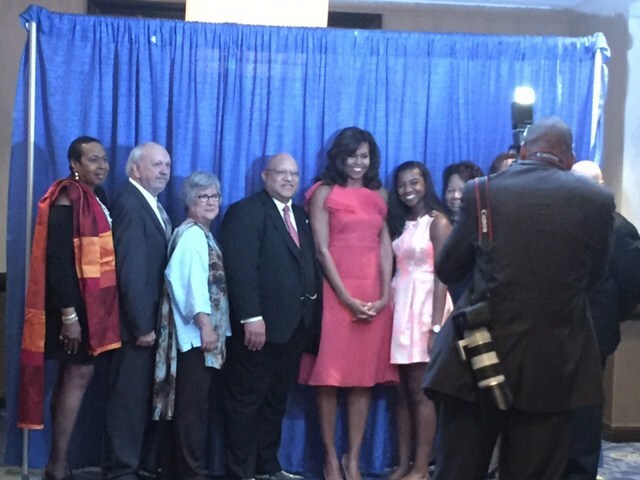 L-R: Florene Dawkins, Fred Fussell, Cathy Fussell, Charles Lewis (Alma Thomas's great-nephew), First Lady Michelle Obama, B.J. Chipman. The three folks to the right of B.J. are her grandmother, her mother, and Frank Mastoris. Oh, and here's a photo of the letter we received, a week after the event, from none other than First Lady Michelle Obama! I told you I'd be back with more details about the process of making this quilt whose "real name" is "Apollo Revisited: Homage to Alma Woodsey Thomas." First, I'm very grateful to Florene Dawkins and Vivian Creighton Bishop for contacting me early enough so that I had plenty of time to experiment, think, experiment some more ... Florene first contacted me in June of 2015, and the event wasn't to be held until May of 2016, so I had almost a year to produce the quilt. Second, I very much appreciate Florene and Vivian's giving me free rein to make whatever I wanted, so long as it was "inspired by the work of Alma Thomas." I understood that if the quilt were eventually gifted to the First Lady it would first have to have approval from them and their committee, of course, but they were very generous in their trust of me, and that trust was most helpful to my creative process. I'm not much of a procrastinator, so I got started right away. First, of course, I took a very close look at Alma Thomas's body of work. So much good stuff! Isn't that beautiful? Google "Alma Thomas and White House" and you'll find more images of it. I think it's perfect for that spot. My attraction to this painting, and my interest in replicating it in fabric, had a lot to do with the fact that it features so much blue -- so many blues. I love blue, and I also thought that I might be able to use a good deal of denim, which for a number of reasons I love to use. One of those reasons is the fact that Columbus has, over the past 150 or so years, produced a great percentage of the world's denim. A second reason has to do with the fact that I now live and work in a loft apartment inside the building that once housed the mill that produced that denim -- Swift Manufacturing Company. While I liked the pillow fine, I thought that the tone, the value, of the denim wasn't as "bright" as what an Alma Thomas-inspired piece called for. Denim has a white thread in it, you know, and Thomas's colors are true and clear and bright. So I ditched the denim idea and went with cotton duck, which comes in an array of full, bright colors. Maybe I should back up and say that at first I experimented with "regular quilt fabrics," what we call Kona weight cottons. But they would have required precise piecing or applique, with clean, turned-under edges, and I thought that the canvas duck, with its strength and raw edges, better replicated Thomas's brush strokes. Okay -- Now I'm gonna hush and just let you look at some photos of me at work. Except let me tell you one more thing -- Each and every piece of that canvas was individually cut out by me -- carefully, thoughtfully, with scissors -- and then, using a darning foot, sewn down to the canvas twice around. (After all, I didn't want Michelle Obama's quilt to fall apart!) That took a while, and some wrangling. I needed an intern to stand on the other side of the machine and help me wrangle. Fred did actually help with that a few times. After I got all the "dots" sewn down (I did, literally, see them in my sleep! ), I sandwiched the thing -- That is, I layered the completed top with a layer of batting (wool) and a backing -- and I started machine quilting -- in circles, 'round and 'round. I hand-quilted the center, though. Hand-quilting is really my thing, and while the canvas and duck were much too heavy and thick for hand-quilting the whole quilt, I did want to include a bit of hand-quilting -- so there it is in the center. Finally, I bound the edges, added a label and hanging sleeve, and the finished quilt was ready to be submitted to committee. The date was July 31. I had spent two weeks in June experimenting, but by the first of July I had decided my materials and method and had begun work. I worked every day during the month of July -- four weeks -- several hours each day -- to complete the work. It was a labor of love. My thinking was that if the committee didn't like the quilt I'd made, I had plenty of time to make another -- or another -- or another ... But they liked the first one, and it was eventually shipped to Washington for the event. Obviously, I didn't "primp" for the photos -- ha! I'm in work mode. I worked from a glossy photo of Alma Thomas's painting, pictured in foreground. "Apollo Revisited: Homage to Alma Woodsey Thomas" by Cathy Fussell. It all started in 1891, with the birth here in my town of Columbus, Georgia, of one Alma Thomas. If you read that link you'll learn that Alma grew up to become a well-known artist -- so well-known, in fact, that -- fast forward many years -- she came to be a favorite of First Lady Michelle Obama, who has added three Alma Thomas paintings to the White House collection. One hangs in the White House dining room. Here's a photo of it here. I so love it! Fast forward another little while and I come into the picture when I was asked, by Vivian Creighton Bishop, the wife of our U.S. Representative Sanford Bishop, to make an Alma Thomas-inspired quilt to be presented to the First Lady at the 2016 Congressional Club First Lady's Luncheon, of which Mrs. Bishop was chair. So I did. The event took place on May 12, 2016. To say I was honored to be able to do this is an understatement of enormous proportion. I only hope that the First Lady likes the quilt, and that I have done honor to Alma Thomas and to our town of Columbus, Georgia. Specifically inspired by Alma Thomas's painting titled "Apollo Splashdown 1970," I named this quilt "Apollo Revisited: Homage to Alma Woodsey Thomas." I owe tremendous thanks to my friend Florene Dawkins, who knew my quilting and who knew of my long-time interest in the work of Alma Thomas, and who suggested to Mrs. Bishop that I be asked to make the quilt. In a later post I'll write about my process and about the decisions that went into designing and making the quilt. Oh, and when the official photos of me with the First Lady arrive, I'll post those, too.